For our family the journey towards cutting out single-use plastic has been full of surprises. With determination and a lot of creativity we got through the tough part and came out the other end feeling more connected to our local community, local shops and local producers, as well as the seasons and nature generally. Our simplified lifestyle has given us back time and provided a steady rhythm to our week. Once we gave up buying a lot of unnecessary stuff wrapped in unnecessary plastic, we realised how much time we had spent carting it around and trying to recycle it. It felt like a huge relief to stop the manic consumer merry-go-round and simply get off! There is an increased sense of wellbeing and more mindful living as a result. When we first stopped buying plastic for one year we were amazed how quickly the rubbish and recycling diminished. It’s only logical of course, but it was the most visual evidence of the changes we were making and it happened really quickly. We eventually got a much smaller bin and this only needs to be emptied every two weeks or so. It really boosted our motivation to think that so little was going to landfill. As we have a compost heap and a food bin that is picked up weekly, we don’t even bother with a bin liner as there is nothing smelly or wet in the rubbish bin. The recycling has become quick and easy too as there is no longer any confusion as to what can be recycled. Truly worth the experience! I don’t know about you, but I find supermarket shopping a bit soul destroying and anonymous. Luckily, plastic-free shopping and supermarkets don’t really go together, so that’s why my Benefit #3 is the joy of being less dependent on the big retailers and the big brands. You only need to look up into the vast ceiling of a supermarket, with its strip lights, air ducts and steel girders to remind yourself of the industrial nature of supermarket food supply. Plastic-free shopping means utilising markets, farm shops, butchers, bakers, refill and zero waste shops for unpackaged shopping. Discover how wonderful it is to buy the things you need without a plastic film between you and them. The secret is to take the pressure off yourself and keep meals, toiletries and cleaning very simple. We have transformed our shopping habits and only go to the supermarket for a few items every now and then. Bliss. In contrast to the anonymity of shopping at supermarkets, the experience of getting to know local shop owners, stall holders and producers has been a heart-warming experience. People know us by name and are keen to help us shop plastic-free. We get to know how they run their businesses, how they procure food and we know where our money goes. Shopping with our weird tins, boxes and fabric bags has sparked many conversations with curious fellow shoppers, as well as invitations to give talks and workshops. Eventually a local action group was formed, with the aim to reduce plastic waste in our town and we are helping the district council to implement a motion to become single-use plastic free. Joining up with like-minded people who want to reduce plastic waste is interesting and creates new friendships. It’s rewarding to see individual actions combining to become a local movement. Since cutting out single-use plastic, there is so much less clutter and stuff in drawers & cupboards around the house. Gone are zillions of plastic bottles of cosmetics, toiletries and cleaning products. Gone are the dozens upon dozens of plastic packages of foodstuffs. No more bags stuffed full of plastic bags under the sink. Even the shed and garage have had a good purge. Gradually, as we simplified and reduced the amount of stuff we thought we needed, each room became calmer and lighter. Friends have also commented how relaxing it feels to be in our house. Another wonderful side effect! There is something incredibly satisfying about learning how to make things that we previously only ever bought in a shop. I am talking about foods such as flatbreads, hummus, nut milks and muesli, but also cleaning products, deodorant and toothpaste. Equally enjoyable is growing things, like sprouts, watercress, basil or chillies in a pot. It is a revelation how easy and cheap it is to make or grow things yourself. A point in case was making windscreen wash for the car with just three ingredients costing literally a few pennies. There is a growing feeling of achievement and confidence in our ability to be self-reliant and resourceful. Once we started to refuse almost all single-use plastic (and lots of multi-use plastic too) recycling became so easy. Cardboard, paper, glass, tin and foil are all easily recyclable and for the most part can be made into the same material again. Without plastic packaging, there no longer is a dilemma about all the different types of plastic and mixed materials and whether the council is simply selling it abroad to poorer countries, sending it to landfill or burning it in an incinerator. Only 14% of plastic materials collected in the UK are actually recycled, or rather downcycled. But because our family buys so many things unpackaged, there is a lot less recycling in the first place which significantly reduces sorting, moving and worrying about it. We love the peace of mind about how little rubbish we create. Striving for a lifestyle without single-use plastic is like going on a healthy diet: you stop eating junk food and snacks and instead eat small portions of food that is nutritious and carefully prepared. In the beginning there was a period of astonishment at all the things we could no longer buy, followed by an attempt to replace everything with something similar but unpackaged, and finally the realisation that we didn’t really need all that much. As soon as we became reconciled to the simplicity of cooking simpler meals and making do with fewer things, out of the necessity of avoiding packaging, it dawned on us that this lifestyle means a lot less consumption overall. I don’t mean austerity, but rather cherishing the basics and enjoying them fully. Queen of zero waste, Bea Johnson, says that when you buy anything at all you are saying to the manufacturer: “I like this, please make more”. Our purchase is a vote and a clear message is communicated from the buyer to the seller. We also feel that refusing to buy something sends a powerful message too, especially when we also engage in conversation with the shop owner to let them know why we don’t want to buy single-use packaging or what type of products we would prefer. As friends, neighbours and other people joined us in this, some of our local shops began to listen. A local health food shop now has tongs at the deli counter because so many of us asked for them not to use plastic grab sheets. When significant numbers of individuals vote in the same way, shops take notice, manufacturers take notice, the media take notice, and in time there can even be a change in the law as was the case recently with plastic drinking straws. Casting a conscious vote in this way feels incredibly empowering. The main argument for plastic packaging, according to supermarkets and producers, is that it keeps food fresh for longer and reduces food waste. This may be a benefit for the store, but in my experience plastic packaging causes a lot of food waste at home. I used to buy too much food at the supermarket regularly (partly due to multi-pack offers and partly due to impulse buying) and stuff everything in the already overfilled fridge, safe in the knowledge that the plastic packaging would ‘keep it fresh’. And then, just as regularly, bags of ready-washed salad leaves would turn to sludge, yoghurt & dips would go out of date, packets of mushrooms would go sweaty and slimy, cucumbers would go floppy in their plastic skins, cheese would grow white mould, meat would go a bit smelly or dry out, and so on. The benefit of buying unpackaged is that a lot of it is seasonal, local and fresh. It hasn’t been in cold storage for months, on the road for weeks or on shelves for days on end. We buy less and store it differently, using glass, stainless steel, cotton bags and beeswax wraps. We also make more things from scratch, such as hummus or almond milk for example. On the whole, everything is more valuable to us and none of it is wasted. For our first plastic-free Christmas, we decided that we would avoid the usual shopping & plastic packaging frenzy by giving each other only a few second-hand presents. This turned out to be a lot of fun – we bought used books, art, shirts, games, tools and kitchen implements. It made us more aware that buying, selling and swapping used items supports a re-use and recycle economy. Flea markets, vintage shops, antique shops and second-hand shops (also online) are useful for finding items that are of good quality like furniture, gardening tools, cutlery and crockery and all manner of things made of brass, wood, glass, leather and fabric. You can get just about anything second-hand (this week we bought a used stove-top whistling kettle) and it is well worth looking for a pre-owned item first before deciding to buy something new. Plastic is a life enhancing and life-saving material with many important applications, not least in the field of medicine. The problem is that it is so cheap and so difficult to dispose of. It has found its way into every aspect of our lives and into every nook and cranny on this big blue planet. From the minute we get up and brush our teeth to the minute we set our alarm and turn off the bedside lamp, we are touching plastic material. Removing these layers of plastic between us and our food and choosing more natural materials for our household had a very noticeable and pleasant effect on our physical senses. It is a joy to touch, smell and look at natural things and we feel reconnected with the natural world in a very real sense. We all want to protect what we love – and in our case it is this rekindled love of the natural world and wanting to protect it that keeps us going with all our efforts to banish unnecessary plastic from our lives. All sorts of chemicals are added to plastic in order to give it different properties for different applications: clear plastic film, flexible plastic bottles, stiff plastic bottle tops, etc. In addition, the contents of plastic packaged goods often contain a host of chemical additives and preservatives. In the past, I was conscientious about buying organic but didn’t think about the chemicals in the packaging. Avoiding plastic packaging altogether and switching to more natural or homemade toiletries, cleaning products and cosmetics is a great way to detox your home. We also choose natural materials for clothing, interiors and many other things besides. Reducing the amount of plastic that enters our home (and actively communicating about it at every opportunity) has had the effect of making us feel part of a rapidly growing movement that is racing towards a tipping point. Author and sociologist Malcolm Gladwell describes the tipping point as that magic moment when an idea, trend, or social behaviour crosses a threshold and spreads like wildfire. According to Gladwell, epidemics happen because of the opinion of only a few people. Economists call this the 80/20 principle, where only 20% of the people will do 80% of the job. Research about ‘influencers’ on social media and in corporations suggests that as few as 3% of influential people set new trends. So, what I am saying is that we don’t need to change every single person’s behaviour on the planet – we just need to get the influential few on board! Feeling part of a movement is energising. Somehow it has become the norm to eat breakfast, lunch and dinner made with ingredients from all over the world and served with meat or seafood at every meal. Conveniently, you can leave shopping to the last minute and if you don’t have time or the inclination to cook, you can just choose a ready-made-meal with all the trimmings. Buying plastic-free however, is a labour of love and requires planning ahead. It usually means cooking with fresh ingredients from scratch and excludes the majority of ready-made meals and processed food. We soon realised that we didn’t have the time to cook a proper meal every night of the week and so we went back to weekday basics – a bit like it used to be when we were growing up. It feels liberating to cook simple meals like baked potato with cheese, pesto pasta or fried eggs on toast, served with veg or a salad. We leave the full-Monty meals for a special treat on the weekend, when we have more time to try out recipes and spend time cooking together. Swapping mass-produced items such as plastic razors and tubes of shaving gel with an old-fashioned stainless-steel safety razor, badger brush and shaving soap dish feels stylish. There is a sort of vintage chic to the decorative glass bottles we refill with homemade toiletries and cleaning products, the baskets full of various wooden brushes, the glass milk bottles delivered to the back door, the metal tiffin boxes, the hand-sewn fabric shopping bags and the pottery dishes for locally made soap, to name but a few items. Saving a beautiful gin bottle or buying antique glass storage jars is just so much more aesthetically pleasing than the old Tupperware and branded single-use plastic bottles. No contest. The topic of living without plastic has opened up a whole new world of learning to us as a family. Even though it is all about the practical solutions in our daily life we also wanted to know as much as we could about the problem of plastic pollution and the unintended consequences of the alternatives to plastic. Most recently our reading list has included: Don’t even think about it, This Changes Everything, The Shock of the Anthropocene, The Invention of Nature (biography of Alexander von Humboldt), Plastic Free by Beth Terry, as well as research papers by the Ellen MacArthur Foundation, WRAP, Eunomia, UNEP, Greenpeace, The Environment Agency, the Marine Conservation Society and others. One of our sons included the topic in his thesis and introduced us to new academic studies and our other son incorporated ocean plastic pollution as a theme into his A-level artwork. Reading books and research papers, watching documentaries and debating the issues with others is intellectually stimulating. We know that food travels many miles before it reaches supermarket shelves and that this contributes to global warming. Food is produced in one country, washed in another, packaged and labelled somewhere else entirely, sent to distribution centres and so forth. Single-use plastic is used in each of the processes throughout the supply chain. Going the extra mile (pun intended) to buy loose fruit and veg that are in season, directly from the farmers markets and farm shops, has helped us to avoid packaging and excessive food miles. We still enjoy avocados, bananas, oranges and other exotic fruit and veg, but we pay much more attention to when these are in season and how far they have been transported. The same goes for meat and dairy too – local is best even if it means spending more and having it less often. With some creativity, planning and simplifying, our first plastic-free Christmas turned out to be a joyful antidote to the usual shopping frenzy. It was a relief to have a Christmas without piles of plastic boxes, bottles, packaging, plastic toys and even plasticky gift wrap & ribbons. We managed to generate only the tiniest amount of rubbish. We gave each other books, socks and stocking fillers from second-hand shops. We ordered the food from our usual farm shops and food co-operative and one of the kids made paper crowns on the day. It all felt very wholesome, like Little House on the Prairie, but in the 21st century! For a big 50th birthday bash with 100 guests, a local bistro helped us to be as plastic-free as possible down to the smallest details, which helped to create a very distinctive and beautiful atmosphere (the bistro subsequently made changes to cut out single-use plastic permanently). We found that when we keep things very simple, there is less pressure and celebrations can be more about the experience and creativity. New life is breathed into old traditions. At the same time as cutting out single-use plastic, we also wanted to try and move away from other things made of plastic that are used over and over again. Many of those items have a short life-span because of so called built-in obsolescence, meaning that the products are deliberately designed to become obsolete after a short time because the design will fall out of favour or the item is not repairable or of insufficient quality to last. Both of these types of designs (single-use and built-in obsolescence) encourage us to throw away and buy new. We felt a gradual shift, moving us away from buying cheap items towards really cherishing everything we have and making it last as long as possible. When we do need to buy something new, we look for quality, durability and sustainable design. On the journey to zero plastic packaging, we found that food, toiletries, cleaning products and clothes produced by vast industrial processes began to disappear from our lives. The big brands use industrial methods of farming and manufacturing which require chemical fertilisers, pesticides, preservatives and other additives. You only need to read the ingredients of an ordinary tube of toothpaste to make you realise that you don’t really understand what’s in it. As we learned to make our own toiletries and cleaning materials and cut out ready-made meals & snacks and much of the processed food we were used to before, we felt the positive impact on our health and wellbeing of this new lifestyle. Our kids and the environment benefit too and that’s one of the best reasons I can think of to keep going! We have local shops that provide refills for laundry and dishwasher liquid, shampoo, conditioner and more. Together with some other key ingredients such as bicarbonate of soda, borax substitute, vinegar and essential oils, we can make up simple recipes for both cleaning products and toiletries. But there can still be a lot of plastic in the supply chain of these products and ingredients. Of course, we could just clean with a brush, a cloth, a bar of soap and water. Why not? Who says we need to disinfect and bleach our homes? Who says we need to revolutionise our hair colour and rejuvenate our skin? Answer: Procter & Gamble and L’Oreal! We disagree. Turns out we don’t even need a spray bottle for cleaning, or so we decided after months of looking for a non-plastic one. We find the back-to-basics approach very useful to help us think outside the box. For a start it’s very good for the environment and saves on nature’s resources and on top of that it saves us money. To give you just one example of a simple and uncommercial solution, we use left-over lemon to get bathroom tabs sparkling. Cheap and effective! Striving to live without plastic has boosted our creativity and has also sparked creativity in others. At a recent birthday tea party my lovely friends & family brought the most heart-warming plastic-free presents including homemade cards, hand-sewn fabric bags, a copper garden trowel, a willow basket, bunches of home grown flowers and lettuces, books, pictures, homemade bath salts and body oils. For the party I bought a stack of pretty, second-hand cake plates for just £3 and served cake, tea & Pimms to keep it simple and as packaging-free as possible. This type of creativity extends into every aspect of our lives, from the way we celebrate special occasions to the way we shop, work, garden, decorate the house, travel and fill our leisure time. If you are familiar with Abraham Maslow’s ‘Hierarchy of Needs’ you’ll probably enjoy the reimagined version by illustrator Sarah Lazarovic. 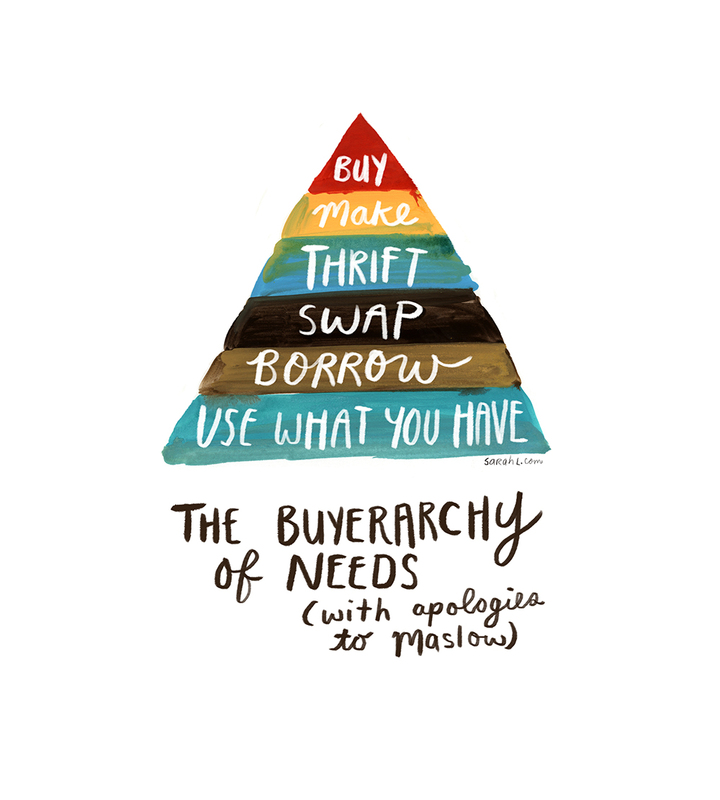 Her Buyerarchy of Needs goes like this, starting with the highest priority: use what you have, borrow, swap, thrift, make and lastly buy, but only as a last resort. For us this became reality because we wanted to avoid new plastic and plastic packaging as much as possible. The things we already possessed became very precious to us and we look upon them with a new kind of tenderness. A trusty old backpack was furnished with a new metal zip by a local seamstress when the old one broke, the loose sole of a pair of sheepskin slippers was sewn back on, old trousers were turned into shorts, worn out clothes turned into fabric bags and so on. Even much larger items can be repaired or bought second-hand. Repairing, upcycling, buying second-hand, as well as swapping, borrowing and sharing are all sustainable and cost-effective alternatives to buying new stuff. We all have too much stuff anyway, so giving a new lease of life to what you already have is tremendously important and satisfying. On the eve of leaving for the WOMAD festival to join a panel discussion with fellow anti-plastic fanatics Sian Sutherland and Daniel Webb, I reflected on the huge benefits of joining forces with others. When we first set out on our journey of cutting out plastic as a family, we felt a bit alone and ‘freakish’. But it didn’t take long before we found others who were doing inspiring things and who helped us to achieve our goals: the local transition network group, local repair cafes, youth groups wanting to get involved, local councillors, individuals with the same concerns as ours. Beyond the community we live in, there are many others across the globe joining forces on social media, at festivals, through writing and campaigning. The circles keep widening out and we no longer feel alone but part of a huge tribe. Initially, we were very excited by the promise of new innovations and products coming on to the market that will ultimately replace single-use plastic. But our enthusiasm waned with the realisation that new products and new materials fuel our consumption rather than reduce it. The problem with plastic is not just that it causes harm to the environment when it is used mindlessly, but also that it encourages mindless consumerism. Replacing plastic items such as packaging and other single-use items like-for-like with another type of material will almost certainly cause further harmful unintended consequences. Cutting out single-use plastic and finding simple solutions to our day-to-day needs has had the result of us being less interested in visiting shops and searching for things to buy online. The reduction in our family’s consumption, which we discovered has multiple benefits that surprised us, has given us an opportunity to re-orientate. The old adage that we get more happiness from experiences than from material things comes to mind. Spending time with each other and sharing experiences is good for our soul and cannot be replaced by material things. Given our Western lifestyle, we struggle with the dilemmas of driving cars, using oil to heat our house and going long distances for work and holidays. However, the relatively simple act of cutting out the vast majority of single-use plastic from our household makes us feel better about our accountability. It’s a work in progress, but there is a sense of empowerment and growing motivation to make more positive changes to our lives for the benefit of the environment. In the beginning we thought that swapping items wrapped in plastic for compostable packaging, paper, cardboard or metal would be the answer to all our problems. We spent many an hour on a wild goose chase tracking down products that we thought we needed: tea bags, ready-made salads & sandwiches, crisps, breakfast cereal, biodegradable bin liners and many more. We soon learned that all packaging comes at a cost to the environment and that the production and disposal of alternative types of packaging causes unintended consequences. We realised that recycling is a red herring, that compostable plastics are not recycled or even collected by any UK councils, and that the term ‘biodegradable’ is completely misleading. Land, water and chemicals are needed to extract or grow the raw material for packaging, as well as transportation and industrial processes to dispose or recycle these materials. Joined-up thinking means being informed and thinking through consequences from production through to disposal, enabling us to make better purchasing decisions. People often have two reservations about changing their lifestyle to cut out single-use plastic: they assume it is more expensive and that it takes a lot more time. In the beginning it does take effort to think everything through and to establish new habits and routines. But as we became better at it, we found that we saved a lot of time through simplifying the way we shop, cook and clean. Buying unpackaged means spending less time dealing with packaging waste, sorting out recycling and taking out the bins – in fact, we only need to empty our bins occasionally as there is so little waste in it. Simplifying toiletries and cleaning products also saves time and money – making a batch of toothpaste takes a couple of minutes and costs pennies, as does cleaning with vinegar or bicarb of soda. Overall, we feel like there is more time and space in our lives now. One of the best benefits of going single-use plastic free is how easy it is after the initial struggle. Once you have formed new habits and settled into a new ‘normal’, you will look back and be surprised at how capable you are and how every little success emboldens you to keep going. It is not like making a new year’s resolution to go to the gym, where after a few weeks you go less often and finally stop altogether. This is different. Once you have found a workable solution you won’t feel the need to go back to the old ways. Every obstacle that you overcome will make you even more ambitious. Every conversation you have about plastic free living will inspire someone and will spread the word. That’s what we found and we love it.